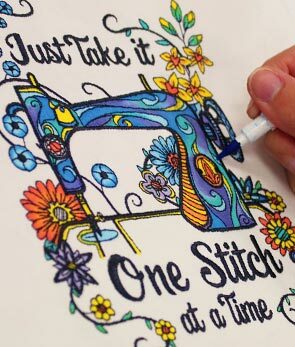 Finish off your summer stitching with beautiful one-color designs! 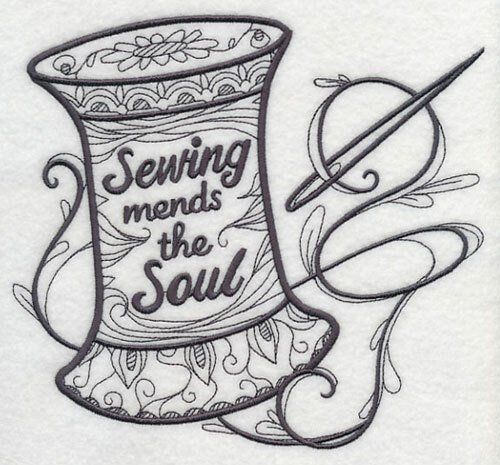 Inspired by pen and ink sketches, these quick-stitching motifs are perfect for adding embroidered style to your projects in a flash. 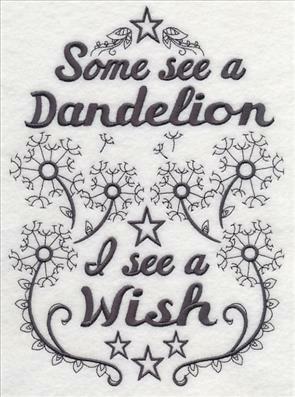 Sewing quotes, words of inspiration, and other phrases are stunning as framed artwork, on totes and pillows, and more. 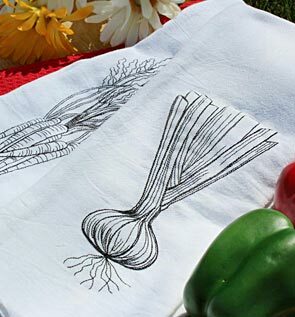 Or, whip up a new set of tea towels with quick-stitch veggies! Plus, one-color icons such as a camera, sewing machine, record player, and more are terrific additions to apparel, wall hangings, quilts, and more. 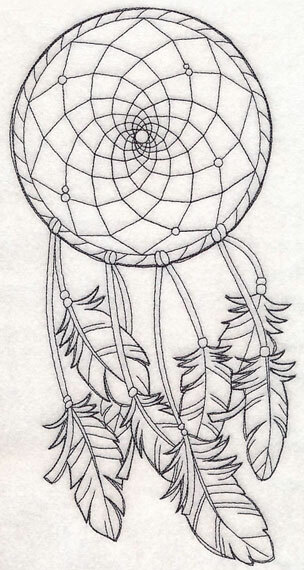 Order these easy-breezy designs today! 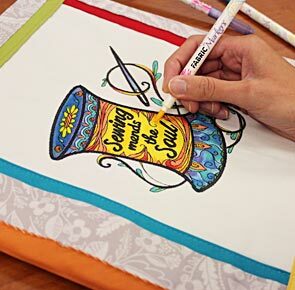 Create a coloring book using one-color embroidery designs and fabric markers! See how it's done here. Give your crafty studio an oh-sew-fabulous update with these striking designs. Layers of light and heavier stitches add texture and depth to the one-color motifs. 7.61" x 6.87" and 6.50" x 5.87" and 5.39" x 4.87"
These designs feature a gorgeous balance of intricate details and light, open spaces, making them look just as impressive as heavier designs. 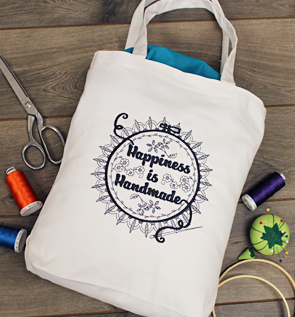 Use as a quick way to update your apparel, tote bags, and home decor. 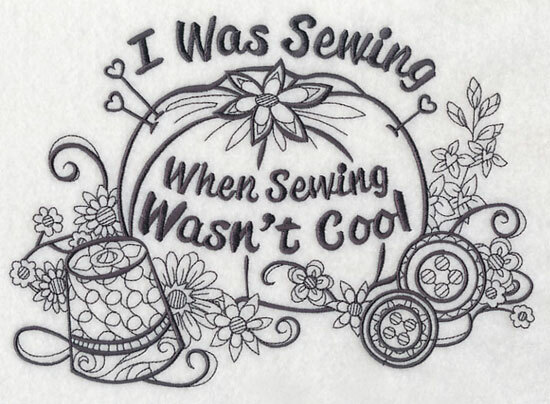 7.80" x 7.75" and 6.90" x 6.86"
5.90" x 5.86" and 4.89" x 4.86"
Give your sewing space a crafty (and sassy) update with this too-cool motif. A pincushion, thimble, and buttons adds sewing appeal; light-stitching details make it ultra eye-catching. 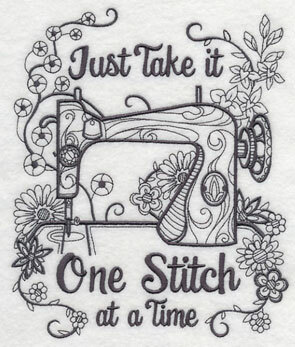 9.59" x 6.90" and 7.78" x 5.60" and 6.75" x 4.86"
Stitch all of the sewing sayings together in a series of framed pieces, or on a wall hanging! Pick thread colors to match your decor, or color them in using fabric markers for a personalized, unique look. 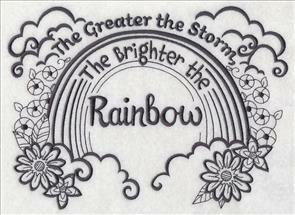 6.60" x 7.79" and 5.86" x 6.92" and 4.86" x 5.74"
Use washable fabric markers to change the colors of the design to fit your mood! Update bedroom decor, wall hangings, and pillows with uplifting words of wisdom and inspiration. Especially great for kids' gear! 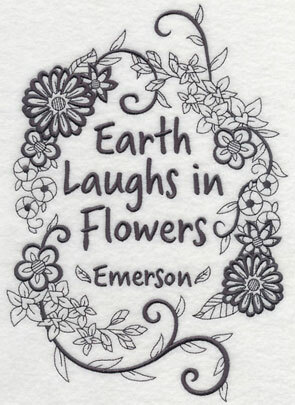 9.38" x 6.86" and 7.81" x 5.71" and 6.70" x 4.89"
Stitch this favorite quote by Ralph Waldo Emerson as a brilliant addition to your home decor. Terrific for gardeners, summer decor, and more. 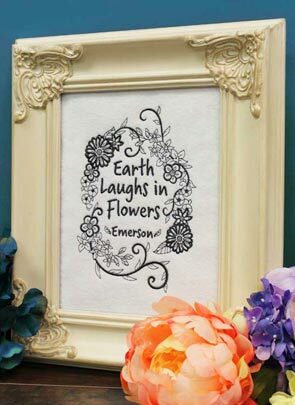 6.90" x 9.67" and 5.56" x 7.80" and 4.88" x 6.85"
A decorative frame is a sophisticated way to show off your favorite embroidery. 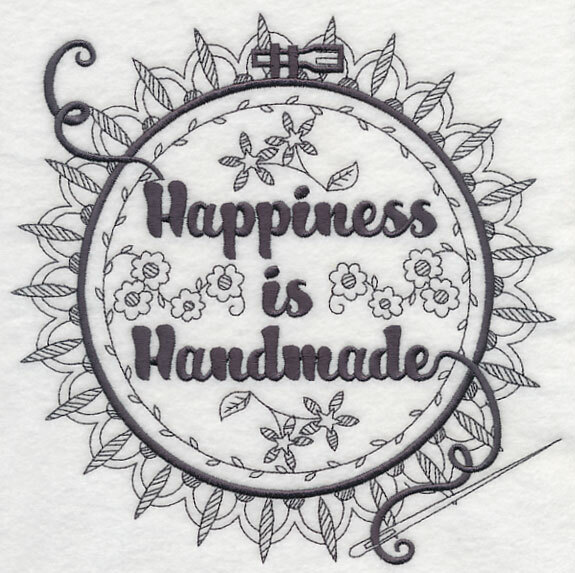 Stitch these sweet sentiments on wall hangings, mini-quilts, and pillow covers as a spectacular way to spread positive messages throughout your home. 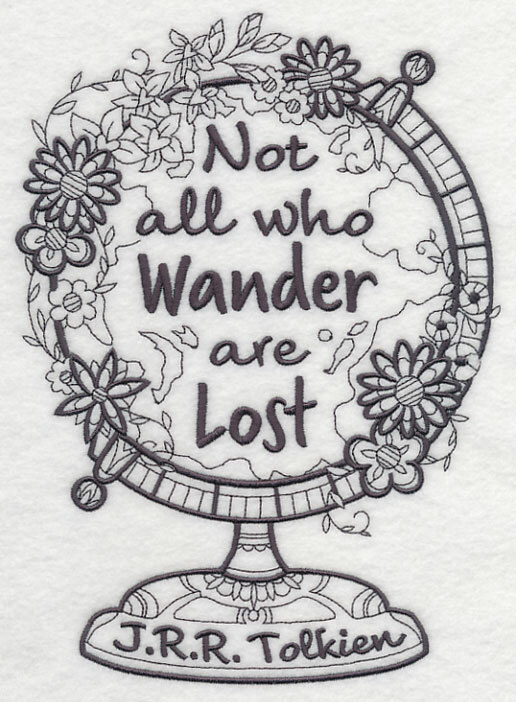 Or, add to tote bags to show your spirit wherever you go. 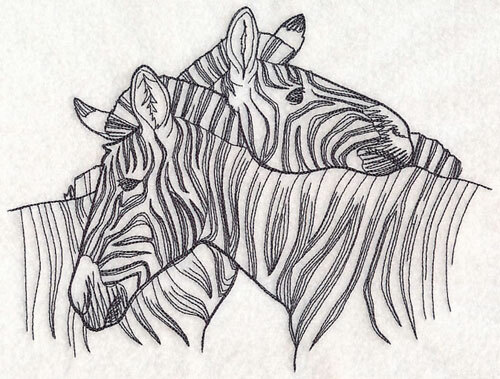 6.85" x 9.41" and 5.69" x 7.81" and 4.86" x 6.67"
A pair of nuzzling zebras adds a sweet look to any embroidery project. Embroider on a pillow for the bedroom, a safari-theme quilt, or a Valentine's decoration. 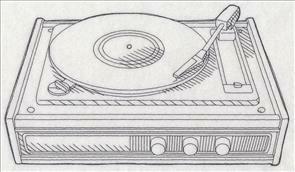 9.15" x 6.90" and 7.75" x 5.84" and 6.43" x 4.83" and 3.85" x 2.88"
What's your favorite hobby? 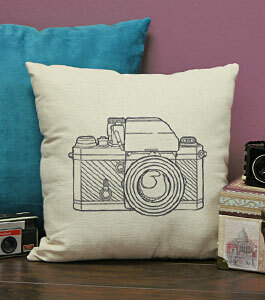 Stitch your interests on pillows, totes, and more with these light-stitching designs. 9.60" x 6.90" and 7.80" x 5.60"
6.90" x 9.60" and 5.60" x 7.80"
4.85" x 6.75" and 2.76" x 3.85"
These light designs are not only unique in their pen and ink style, but they're also especially great for embroidering on neutral, solid colors. 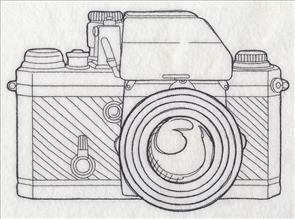 A linen-colored pillow provides the perfect backdrop for this one-color camera to shine. 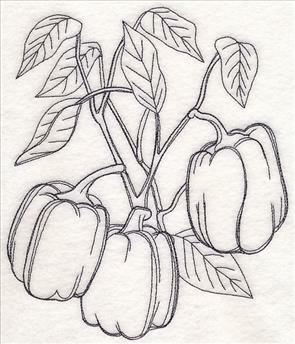 Also striking on canvas tote bags, tea towels, or pillowcases. 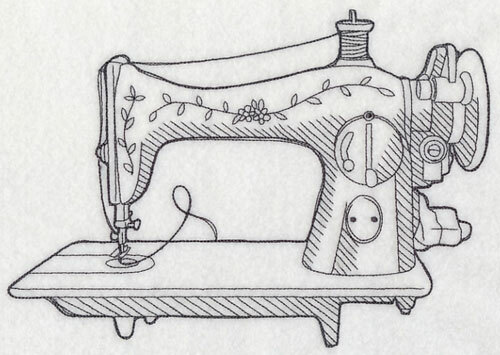 Give your sewing room an antique style with a dramatic, sketchy sewing machine. 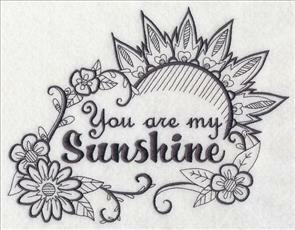 Make mini-quilts and wall hangings with this design to hang in your home! 9.74" x 6.89" and 7.80" x 5.51" and 6.84" x 4.84" and 3.84" x 2.72"
If music or writing is your favorite pastime, you'll fall for these light-stitching designs! 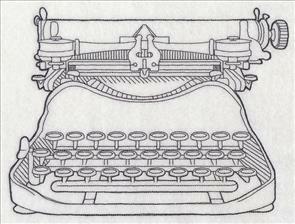 A record player and typewriter are wonderful embroidery additions to any project. 11.74" x 6.71" and 9.40" x 5.37"
7.80" x 4.46" and 6.85" x 3.91"
9.15" x 6.89" and 7.77" x 5.85"
6.43" x 4.84" and 3.84" x 2.88"
A dream catcher blows in the wind in this one-color motif. 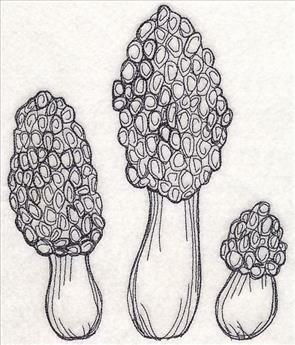 Great for framing and putting above a bed, adding to a quilt, or stitching on a wall hanging. 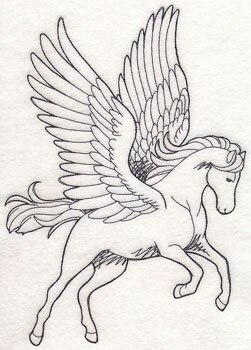 6.14" x 11.75" and 4.91" x 9.40" and 4.07" x 7.80" and 3.58" x 6.85" and 2.00" x 3.84"
Whip up a T-shirt or sweatshirt with one of these mythological creatures! 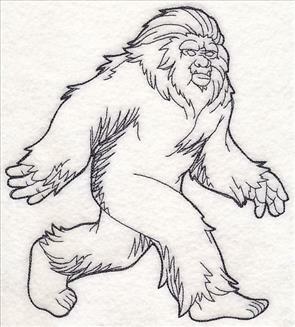 Pegasus spreads his wings, while a Yeti (also known as Bigfoot) goes for a stroll. 6.88" x 9.99" and 5.88" x 8.54"
5.35" x 7.76" and 4.71" x 6.84"
6.85" x 7.61" and 5.84" x 6.49"
4.84" x 5.37" and 3.47" x 3.84"
Fresh, delicious vegetables are the perfect addition to any kitchen decor, and can be added to projects in a flash! 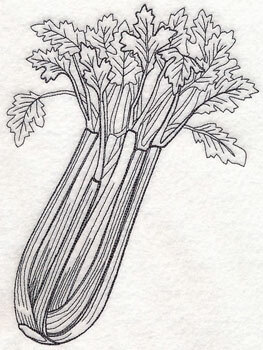 These one-color veggies are tasty on tea towels, aprons, and placemats. 6.85" x 7.15" and 5.86" x 6.12"
5.33" x 5.56" and 4.84" x 5.05"
6.85" x 8.00" and 5.86" x 6.84"
5.32" x 6.22" and 4.84" x 5.65"
Seven of the crisp vegetables were created in this quick-stitch style -- use them to create your own set of Days of the Week towels! 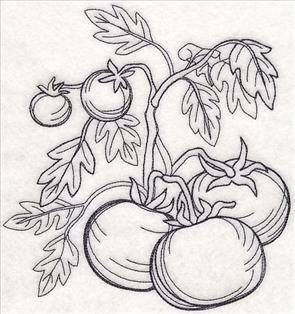 Stitch in the traditional black, or switch up the colors to match the veggies. 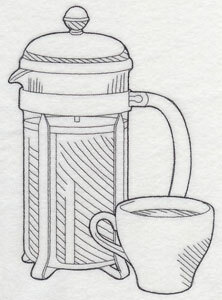 4.93" x 9.03" and 4.26" x 7.80"
3.90" x 7.14" and 3.54" x 6.48"
4.11" x 8.94" and 3.58" x 7.77"
3.25" x 7.07" and 2.96" x 6.42"
A set of dish towels featuring these country vegetables is a welcome gift for anyone! Bring with a bottle of wine for the hostess at your next party. Or, wrap them as a gift for your favorite foodie. See all of our towel projects here (including Fabrics 101 articles for stitching on floursack and tea towels!). Or, page through the Let's Dish Lookbook for more inspiration. 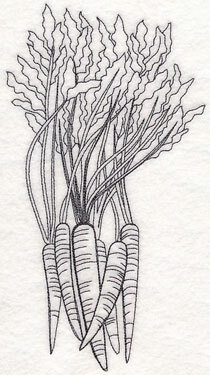 These vegetable designs are light, with open spaces showing through. Stitch on low-nap fabrics including denim, floursack, linen, canvas, and more for best results. 6.85" x 7.14" and 5.86" x 6.11"
5.33" x 5.56" and 4.85" x 5.06"
6.85" x 8.05" and 5.86" x 6.88"
5.32" x 6.26" and 4.84" x 5.69"
Whip up the perfect tote bag for any farmers market with these designs. 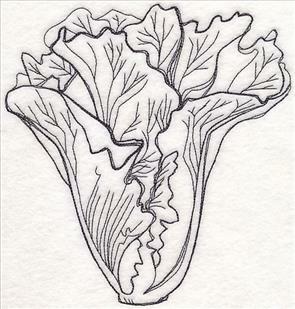 The seven types of veggies -- lettuce, peppers, carrots, onion, tomatoes, celery, and morel mushrooms -- are delicious on any project. 6.85" x 8.16" and 5.85" x 6.98" and 5.32" x 6.34" and 4.83" x 5.77" and 3.23" x 3.85"
Add these fresh designs to your kitchen projects in a flash. Purchase them individually using the links above, or get them all in a design pack. 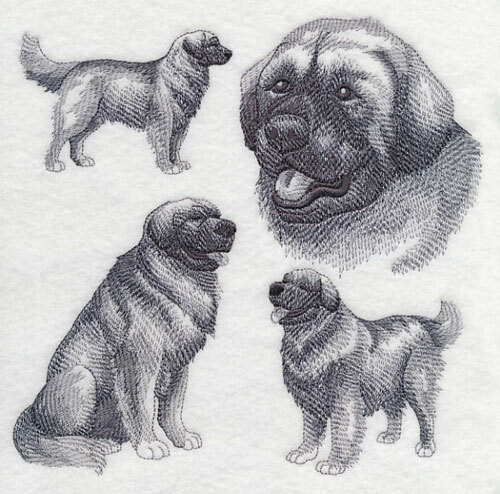 Dorthe from Sweden loves the dog sketch medleys, and was hoping for one featuring the Leonberger breed. A great addition to pillows, tote bags, and more! 7.72" x 7.79" and 6.90" x 6.90" and 5.88" x 5.91" and 4.87" x 4.90"
a popular program, and designs are scheduled through the middle of 2017. But we still want to read your ideas! Send them to support@emblibrary.com for consideration.